Our services include neurological physiotherapy, neurological occupational therapy, speech and language therapy and neuropsychology. In addition we run a variety of exercise classes, a fortnightly orthotics clinic, a regular hypertonicity clinic and comprehensive splinting as required. 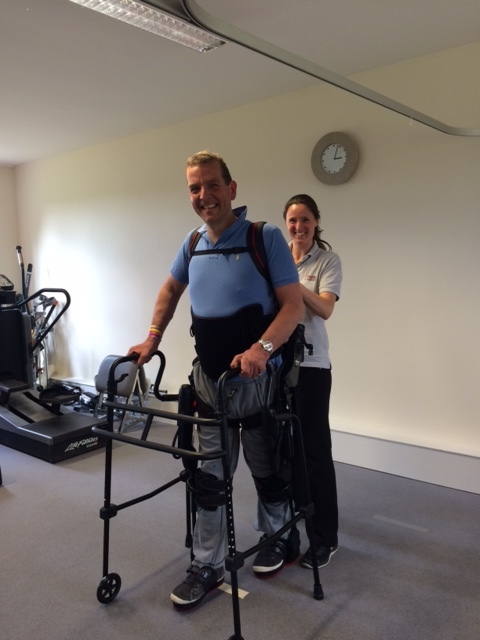 We also have the ground-breaking Eksobionics Exoskeleton available for trials and bespoke packages tailored to individual rehabilitation goals. All areas are fully accessible for our disabled clients. We accept referrals from a variety of sources including Consultants, General Practitioners, other Health Care Professionals, Case Managers and private individuals. Musculoskeletal Physiotherapy: for availability at Hobbs Winchester and Hobbs South West, please contact us or visit Physiotherapy and Wellness. Take A34 (Newbury) & then A33 (Basingstoke). At Kings Worthy turn right onto B3047 (Alresford). At Martyr Worthy turn left into Bridgets Lane (opposite war memorial). Hobbs Rehabilitation is situated on the left hand side about ½ mile from the turning, there is a line of tall trees which lines the back of our car park. Enter through a wooden gate and we are located in the far end of the building. Take A30 & then A33 (Kings Worthy / Winchester). At Kings Worthy turn left onto B3047 (Alresford). At Martyr Worthy turn left into Bridgets Lane (opposite war memorial). Hobbs Rehabilitation is situated on the left hand side about ½ mile from the turning, there is a line of tall trees which lines the back of our car park. Enter through a wooden gate and we are located in the far end of the building.